from la to alberta, faces will turn to the heavens to catch a glimpse of zeta opaiuchi blink out for a moment then reappear. this bit of celestial slight of hand is brought to us by the nimble little asteroid anastasia. she'll be scooting herself between the earth and the runaway o blue-white star to make it appear to disappear for a predicted 8 seconds. naked eye viewing of their performance is limited to a 25 mile swath beginning in the the los angles area at around 3:34 am PDT. her performance will be viewable across the mojave, idaho, montana and on into alberta. non-astronomers as well as those who know their way around a telescope can enjoy this spectacle as well as participate in reporting their observations. detailed info on the paths and times of this asteroid occultation can be found at http://www.asteroidoccultation.com as well as a spiffy faq about what an it is remember to keep your eye on zeta opaiuchi in another 4 billion years when it goes super nova! no word on anasatsia's future plans. 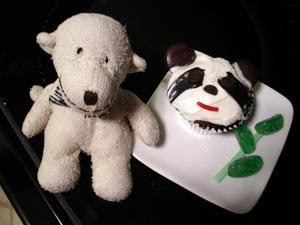 i've been more than lax about updating my blog and i promise i will be writing again, but in the mean time, you can find little tasty tidbits from me on twitter and over on facebook. of course, you can always fine me at my little edge of the web, www.himonkey.net do drop by, have a snack and a refreshing beverage and say a while! my bags are packed and i'm on the go! (as depicted by this lovely portraid of me by apelad) i'll be in china & tibet over the next few weeks and i hope to twitter from the roof of the world! catch my tweets at www.twitter.com/hi_im_monkey or maybe i'll post a little something here! i have a love/hate relationship with the term "children's book." what exactly is a children's book? a book for children only? written by children? young books that will some day grow up to be adult books? as children's book week draws to a close, i really don't have a better grasp on this conundrum. or is it an enigma? it's so hard to tell in this light. i know writing specifically for a children's audience is a tough job and i have undying admiration for anyone who puts pen to paper and produces a story that delights readers or touches the heart and soul. particularly close to my fuzzy little heart are authors of picture books. x-rays often reveal several picture book authors clustered around my left ventricle, each coaxing a rambunctious passle of words into a well behaved little story ready to inspire an illustrator to create new worlds. typing chickens, wolves living in walls or bongo-playing polar bears are rarely encountered in our daily lives, but they are alive, well and ready to come out to play at the flick of a page. detectable by sonography are the chapter book authors working tirelessly just behind my right artria. like mad scientists, they construct their stories patiently, waiting for the day when an unsuspecting eye will fall on the words. photos will crackle, retinas will twitch and neurons will light up as the story is sucked into the brain and ... it's alive!!!! vistas from hobogen to hogwarts glow in the minds eye. ghost spring to life, mice dance and any number of alien life forms communicate in perfect english. so, some may call these books "Children's books." but, let's face it, they are the literary world's equivalent to "gateway drugs." yeah, the first one may be free, they make you feel good, they expand you mind and transport you to other realities. sure, we all say that we can stop any time we want, it's just recreational, but soon, you have a library card, you've found out how to use the interlibrary loan system. you know every book store in any city you visit and can draw a map from memory of powell's books aisles. amazon apps are on your iphone and your ipod is full of audio books. you're consuming books on a regular basis. you don't even bother to hide them. cookbooks in the kitchen, poetry in the bedroom, picture books in your office and shelves and shelves of books all over your house. what about that book on the front seat of the car should you get stopped by a train or have to wait picking someone up at the airport. you share books with friends and talk about it openly. face it, it's an addiction! for me, it started innocently enough with an abc book and a fairy tale here and there. but all too quickly it grew to a multibook habit. sure, my life has been fuller, i have learned and been entertained, i have escaped, i've expanded my horizons and seen the world from other points of view. but at what price? hours of eye strain, the occasional library fine, audiobooks when i take my morning constitutional. is that what we want for the children of the world? well is it? daniel pinkwater always delights me. 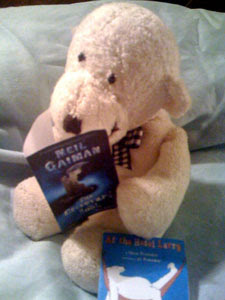 his larry series (illustrated by his talented wife) is a favorite. his chapter books are fun and more entertaining when you can listen to pinkwater himself read them on audio book. in preparation for my upcoming trip to tibet, barbara helen berger's book all the way to lhasa: a tale from tibet has been on my bedside table next to my constant companion, the gashlycrumb tinies by the late great edward gorey. he also illustrated a vast collection of books from hilaire belloc's cautionary tales for children to many volumes of children's verse by john ciardi. drop by for tea, and i'll read you some. 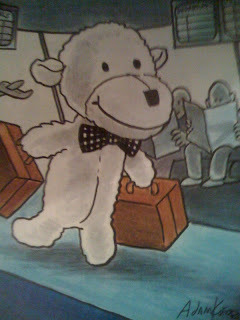 mo willems, the undisputed master of pigeon and knuffle bunny literature, rocks my fashion world with naked mole rat gets dressed. while dutch sneakers and fleakeepers, by calef brown continues the legacy started by polkabats and octopus slacks. now, please pass me that book light and close the door on your way out, ok? is it any coincidence that cory dotorow mentions pinkwater's newest book the yggyssey on boing boing today? yes, yes it is. since i would write today's date as 5 may 2009, the significance of today almost passed me by. when the date is written as 5/7/9 it represents the first of 6 times that consecutive odd numbers will occurred in a date during this century. 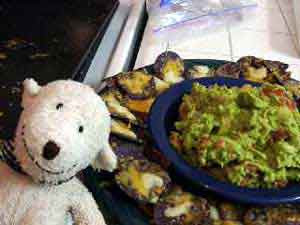 since the next time we have an odd day is in 90 years, i better whip up a few snacks and celebrate odd day while i can. on this day in 1858 hymen lipman of philadelphia received a patent for his revolutionary invention. by incorporating an eraser into a pencil he changed the course of pencil history! mr. lipman sold his patent to joseph reckendorfer for $100,000 who subsequently took legal action against the venerable farber castelle for patent infringement. as a result of the supreme court ruled against him revoked the patent in 1875 saying it was not a new invention. it is a mystery to me when securing a small rubber eraser with a ferrule (that's the little metal band) to the the top of a standard pencil became fashionable or if the myth of why so many pencils are yellow is true. still, i'm celebrating with a rousing chorus of charlotte's heartfelt vocal tribute to the #2 pencil. 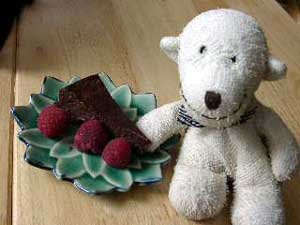 however you celebrate valentine's day, i hope it's full of love and creativity... and a snack or two. i know mine is! 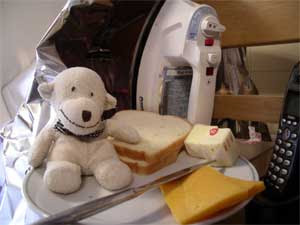 i've brushed up on my weather prognostication skills using a groundhog and i've baked some snacks. i'm ready to celebrate groundhog's day!!! 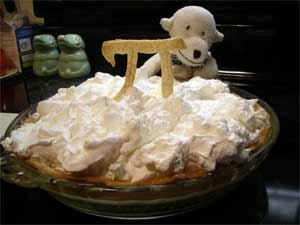 according to the american pie council, today is national pie day! but around my house, every day is pie day! why not make one today... or some other tasty snack. 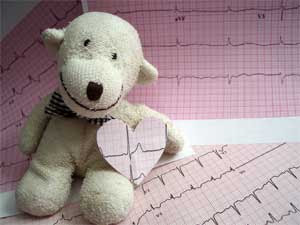 valentine's day is just a heartbeat away! 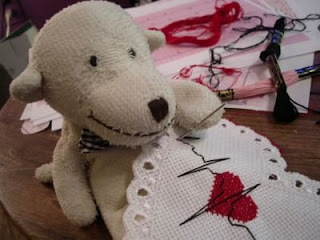 if you don't have time to whip up your own arrhythmia doilies or carefully craft a card, you can still thrill your friends, lovers and strangers with a valentine or two from my personal postcard collection! quantities are limited, so, order now! 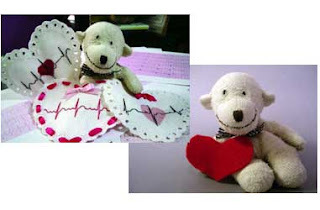 Labels: arrhythmia, cardiac, crafy, crossstitch, embroidery, postcard, valentine, valentine's day. tough choice - will i celebrate elvis' birthday in my blue suede shoes should i put on my red shoes and dance the blues in david bowie's honor? 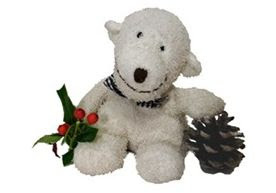 decorating with fragrant pine cones, colorful holly and charming candles is always fun until something bursts into flames. stock up on a few jaunty red fire extinguishers for the holiday season. you'll be glad you did. i've captured this sentiment in a lovely holiday mug, just in case you know someone who might need gentle reminder. every year it lost in the shuffle. smack dab in the middle of the most food centric holiday season - nestled among the thanksgiving pumpkin pie, the hannaukha jelly donuts, the eiz ma’moul, and flood of christmas cookies you'll find national pastry day. i'm a little dismayed that such a yummy holiday is not getting the attention it deserves. despite the good baking weather, autumn through spring is too snack centric to let this holiday shine. from halloween to new years, i find myself earlobe beep in sweet treats. then february ushers in the romantic season of chocolates, strawberries and the distinctive flavor of glue from licking all those valentine envelopes. chocolate bunnies, jelly beans and marshmallow chickens burst on the scene as spring is busting out all over. the way i see it, summer is when this holiday can really step into the lime light. i won't dispute that this is traditionally snow cone and ice cream season (or hot cocoa season if you're in the southern hemisphere), but basically it's bit of a pastry wasteland. ok, june is a pastry chef's nightmare with wedding cakes galore, but, unless you're committed to a serious schedule of wedding crashing, it's the start of the pastry dry spell. i think a nice pastry centric holiday in july or august would be just the ticket. i haven't nailed down a date yet. i'm thinking of a spontaneous holiday where you can just whip up a batch of profiteroles or a plate of cookies on a whim. then while singing the official pastry day anthem the treats are loving exchanged with friend and foe in a gesture of tasty goodwill. enjoy whipping up some treats yourself! the sons of teddy roosevelt hold the dubious disctinction of being the first westerners to kill a panda 1928. subsquently, museums proudly displayed trophy pandas, but no zoological facility could boast hosting a live one of these gentle creatures. 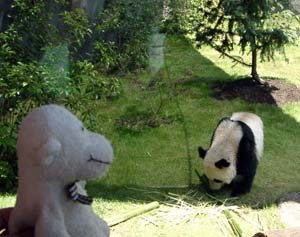 in the 1930's every explorer and his brother were clamoring to be the first to capture a live panda in china and tibet. all that stopped in 1936 when ruth harkenss returned from an expedition with what the ships manifest noted as a small black and white dog. the designer and socialite followed in her late husbands shoes to lead an expedition to tibet returning to the united states with not just a live panda, but a live baby panda who shared her stateroom! don't believe me? 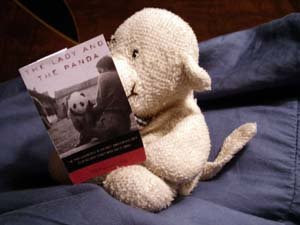 check out exciting book the lady and the panda written by vickie constantine croke. it's never to early to start thinking about your panda costume for halloween! to end national accordion month in style, i accompanied a friend to a late night accordion jam session. the air was still thick with the strains of lady of spain as we emerged form the club, loaded my friend's accordion into the back seat and headed home in the pre-dawn light. as you might imagine, such an occasion requires a celebratory detour to the donut shop to make the day complete. i was considering all the glazed creations and commenting on a tom waits tune that mentions doughnuts when i hear a crash and a car alarm go off. tires squeal as a dark late model sedan races off and we dash to the car. it was too late. glass was everywhere, the rear window was shattered and there all over the back seat of the car were two more accordions and a concertina. unexpected guests can disrupt one's life. 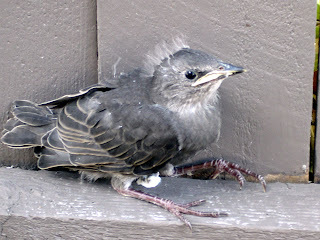 this little chap didn't just drop in, he plummeted from his nest high above my garden sometime last saturday night. since then, he's taken over the place. he has food delivered. he parties with the sparrows that drop by for the seed buffet i put out daily. he's set up his bedroom in the day lilies and a little lounge area on the side patio. i thought he shared my love of interpretive dance as i watched him exuberantly leap, roll and flail about the garden. but, it turns out he was working on his flying. he's soaring to a height of a good 10 inches now. i strongly suggest the he work on his navigation and landing skills before he tests for his pilot's license. he's getting his hopping up to speed too. just when i think he's on the other side of the garden, he shoots through the gate and escapes onto the drive-way of certain death. i don't think his trajectory is premeditated since most of his locomotion is haphazard at best. confused by the new cement-y landscape the feathered fugitive is easy to apprehend. these little expeditions tend to wear him out, so, i usually return him to his nap-nook some crafty avian pal fashioned for him from leaves, kleenex, twigs and a discarded wedding program from a local mega church. 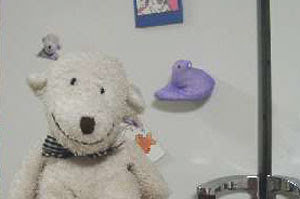 if he starts to redecorate (as some birds are known to do), i have no choice but to start charging him rent. the winner of the two tickets to mr. izzard's concert revealed! it's lydia! she dropped by the cultured cup for a lovely chat and top pick up the 2 ticket (and surprise valet parking pass) for mr. izzard's show "stripped" tonight at the majestic. lydia knows the power of a good smooch to say "thank you!" again, thanks to everyone for care-ing and helping to raise much needed funds for care's relief in burma. 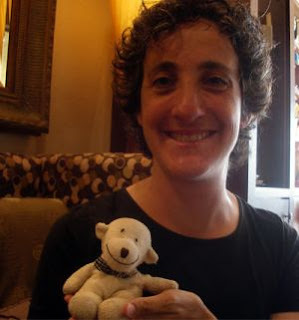 you can still donate, you know, just pop over to lyn's site and click your way to generosity! you can feel the excitement crackling in the air as the large hopper of virtual raffle tickets is rolled onto the stage. lyn has limbered up her fingers so that she is in top ticket selecting form. this is the first raffle that lyn and i have conducted and we are pleased to say that the generous admires of mr. izzard have raised over $250 in donations to care's relief effort in the country formerly known as burma (myanmar). we'd like to thank everyone from the bottom of our hearts for the for care-ing. #6585 and the two runners up. unfortunately, #6585 was not able to use the tickets, so the tickets pass to the first runner up #6592. their identity (and photos) will be revealed pending their notification. once again, thanks to everyone who participated. i sincerely wish i had tickets to give you all! sometimes a little brainstorming with a pal is needed to come up with the best solutions. my guest brainstormer is lyn the proprietress extordinair of cake or death (the ultimate eddie izzard fan site). me: welcome lyn. would you mind reviewing the problems at hand while i write them on the chalk board. lyn: i'd love to! problem 1 - you have you have tickets to eddie izzard's show in dallas that you don't need. 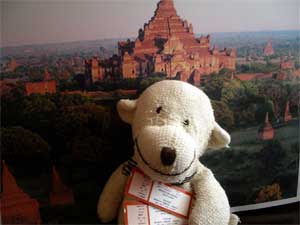 lyn: problem 2 - i want to help care raise money for their relief effort in burma. me: as you can see by the diagram i have made using colored chalk and bits of string, the solution is obvious. lyn: yes...we raffle the tickets off to benefit care. we'll go rest our brain cells while you read the rules of the game. 4 june 08 update: the raffle has now ended! Labels: burma, eddie izzard, what would monkey do? 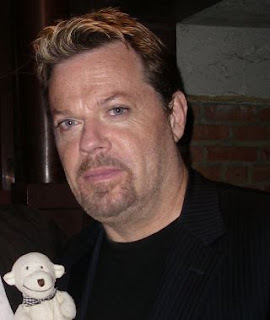 let's say you are a small terrycloth primate with an extra pair of tickets to eddie izzard's june 5th show in dallas, but, you will not be using the tickets. the tickets are nice box tickets that you could probably sell them on e-bay for wads of cash. then again, you could give them to a friend or possibly, you could sell them at face value to a hypothetical stranger. so ask yourself: what would monkey do? Labels: eddie izzard, what would monkey do? 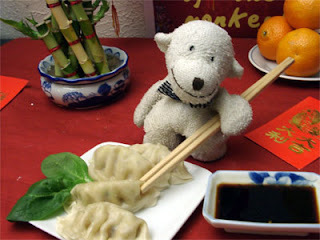 can you imagine my delight to find that chows's aïda mollenkamp has mentioned cooking with monkey as one of her top 10 favorite cooking blogs! what an honor to be listed on a favorite site with the sites i love to persuse and what a delight to see the always entertaining and informative david lebovits. yes that's him whipping up a few treats in the photo. could the tv show "there's a monkey in the kitchen and he has a knife" be far off? on this day in 1990 the world lost great creative mind and warm heart; jim henson. he brought kermit to life, gave him singing and dancing lesson and even taught him to ride a bike. just think about the legacy he's left behind. the buddha of compassion, chenrezig, took a vow to relieve the suffering of all sentient beings, but, things were not going so well. he was alone, overworked, overwhelmed and frustrated. it's no wonder that he just broke down in a fit of hopeless tears. i would have too. but, one of his tears hit the ground and from that spot the beautiful tara manifested announcing that she was there to help chenrezig accomplish his aspiration. she sure knows how to make an entrance, doesn't she? like every good mother, she has an array of colorful manifestations - 21 to be exact - ranging from nurturing to wrathful. of course, what mom doesn't go a little wrathful from time to time when protecting their child? why-oh is it cinco de mayo? on this day in 1862 the mexican forces triumphed over the french in the battle of puebla. this didn't deter the plucky french. they went on to invade mexico city and install maximilian the first (le premier) as emperor of mexico. luckily, the french were run out of town in 1867 or everyone would be speaking french and tex-mex food would include crepes and stinky cheeses. today would be a good day to brush up on your tomato dicing skills as you whip up salsa for your queso dip, guacamole and nachos. oooh la la - i mean ole! today is the day that everyone celebrates that plucky little dragon slayer, st. george. he's kept busy being the patron saint of canada and catalonia, england and ethiopia, georgia and greece, palestine and portugal, montegro, russia, serbia and china too. genoa probably has a salami named after him because he is also patron saint of that city as well a handful of other cities and burgs. just like other dragon slayers, he's a bit of an over achiever, so he's also patron saint for agricultural workers, archer, armourers, butchers, cavalry, chivalry, the brazilian football team, crusaders, equestrians,horses, the order of the garter (who ever they are) riders, saddle makers, scouts, and solders, yet he still makes time for a handful of diseases like lepers and leprosy, skin diseases in general, herpes and syphilis. the english flag is flying outside 10 downing street in his honor today, but, think last years tribute in trafalgar square would be hard to top when 5567 broke the record for the world's largest coconut orchestra playing the monty python mass hit "always look on the bright side of life" prior to a screen of the classic film "monty python and the holy grail" while i know terry jones and terri gilliam conducted the proceedings, i am still unsure if london mayor ken livingston raised his coconut halved and joined in. i know i would. 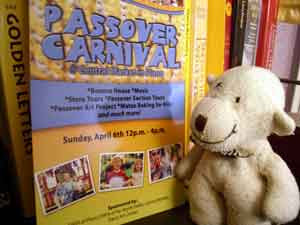 i'm all for celebrating passover and i have been known to partake in a carnival or two (providing the snacks are good and there are no clown in the vicinity). why has it taken so long for anyone to combine the two? i can see it now. everyone enjoying the friendly competition of matzoh toss, beitzah on a spoon race, and the monor eating contests. kids will run themselves silly brushing up on the afikoman search skills while the teens will enjoy a good fright in the 10 plagues house of horrors. the crafts tent will be full of sculptures built of charoset and matzoth and vendors will hawk culinary delights like kosher corny dogs and mogen david spritzers. after a few moments in the temple shaped bouncy house, it'll be time for the children to puke and be taken home. could you ask for more fun? if you're looking for a way to commemorate the years of slavery and arduous journey the jews made into exile in a little more upscale, you can always spend the holiday at a posh hotel. it's april fool's day and here i am without a witty post.please accept my apologies and enjoy and archived copy of my ever so entertaining column on the holiday that appeared in .net magazine in 2005. there a links, and some very attractive photos. i think you'll enjoy it - no fooling. god created the earth, the red sea parted and eddie izzard loosened the buckle of the bible belt a notch or two at the majestic last night. tackling the holy trinity of texas - god, jesus and football he corralled the boisterous dallas audience as he littered the stage with giant squid, spartans and a badger or two. so, basically, a good time was had by all. i have to confess, i was charmed by the way mr, izzard physically manifested his characters in "shadow of the vampire" and "the cat's meow" and have been longing to see him kick off his heels and bring that presence to his stage show. yes, he does cut a fine line in tasteful pumps and girl garb, but, it was wonderful to see the added animation that accompanied his sartorial choice for the evening (jeans, t-shirt, a nicely tailored jacket and sensible flats). i' won't offer a blow by blow description of the festivities. by the time i tapped out my missive, his material will have evolved into a new creature anyway. let's fact it, eddie izzard's shows are like life - you have to be there to experience it. 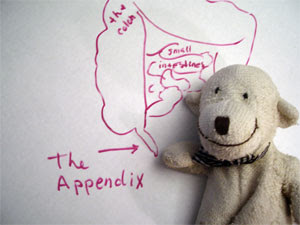 once thought to be a vestigial organ that aided ancient primates with the digestion of grass and leaves, the appendix is now believed to be a safe house for intestinal bacteria. current data shows that this little organic noah's ark helps repopulate the intestines with healthy bacteria after a flood of illness or other natural disaster washes the intestines clean. now that a month of list is dragging to a close, here's a list of my favorite holidays that next month in april. three things i didn't do today because i slept late. do my traditional dance to the dawn as the sun comes up. 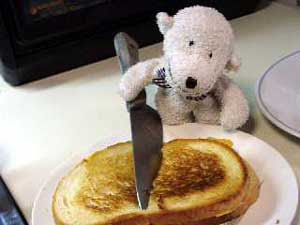 have huge last sunday in may waffle breakfast for all my friends. find the key to world peace. list of interersting tidbits about saturday. for years, saturday morning was the time television stations devoted to childrens programming - specifically animated cartoon. there are over 10 song named "saturday" and an oodle more with saturday in the title. three reasons why i have nothing to blog about today. three interesting things about bhutan. they write using tibetan script. they have a snazzy on line library. aside from gdp, they measure the gnh or gross national happiness. 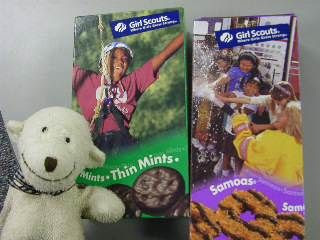 mahalo - thanks - "mahalo for the snack!" puka - hole - "theres a puka in my shopping bag." pa'u - sarong - "everyone looks stunning in a pa'u." iki - small - "mahalo for telling me there is an iki puka in my pa'u." my list of post easter nibbles in my house. to answer the question "what have you been reading?" here's my list list of what i have read recently and what i want to read. happy easter! easter means peep season, so, today's list - "peeps in the news"
special bonus - sweet easter peep post cards! my list of 3 famous people born today only one of which is still alive. it's world poetry day! here's a list of 3 subjects i'd like to see more poems about. 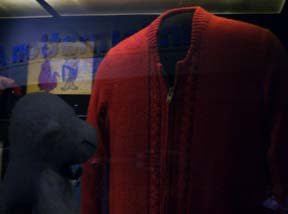 today would have been fred rogers' (of mr. rogers neighborhood fame) 80th birthday. in his honor people all over are celebrating sweater day today. here's my list of three things mr. rogers always did no his show. songs with 19 in the title from the later half of the 20th century. three films that will give you a background on tibet. in honor of st. patrick's day, here's my list of my favorite green things. played an energetic game of feather on a string with my cat. bake a tasty snack for this week. the ides of march. despite the fame that the ides of march get after that unfortunate incident with julius caesar in 44 bc, every month has an ides. it's just a fancy schmancy way of saying the middle of the month. 15 june - arkansas (pronounced arkhansaw) becomes the 25 state in american in 1836. 15 july - st vladami the great day. 15 september - sir alexander flemming notices a bacteria-eating mold (penicillin) growing in his laboratory. 15 october - nasa's galelei spaceprobe cruises withing 112 miles of io - one of jupiter's moons. 15 november - the national broadacsting corporarion radio network (or nbc as we know it today) starts wtih 24 stations in 1926. 15 december - walt disney dies in 1966 before his head is frozen. 15 january - the free wiki content, wikipedia, goes on line in 2001 and revolutionizes the way people get and share information. 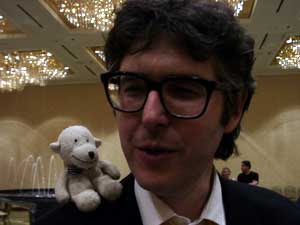 15 february - creator of jeff and akbar cartoonist matt gorening is born in 1954.
happy pi day my friends. to celebrate i'm making two lists! 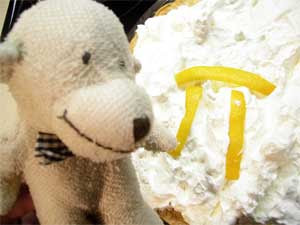 if a pie's diameter is 1 a pies's circumference is pi (3.14). pi is the spelled out version of the greek letter π.
pi is credited with being one of the most imporant mathamtical constant. 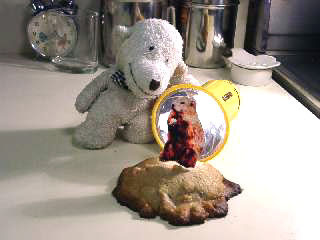 to find the circumference of a pie multiple it's diameter by pi. pies i have made in the past year that i have written pi somewhere on the crust or topping. a rondeau is a poem with 13 lines. a bakers dozen has 13 items. the great seal of the united states there are 13 stars, 13 arrows and an olive branch with 13 leaves and 13 olives. you fans of the periodic table will know that 13 is aluminum's atomic number. on this day in 1912 juliette gordon low founded the girl guides. their name changed to girl scouts and become famous for their annual cookie sales and the inspiring troop 1500. here' the list of girl scout cookies i purchased this year. in celebration of johnny appleseed day, here's the list of 11 apples i've eaten in the past 6 months. 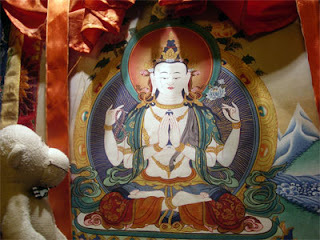 beloved in tibet and with the tibetan people in exile he may well be the most popular buddha in the of our time. 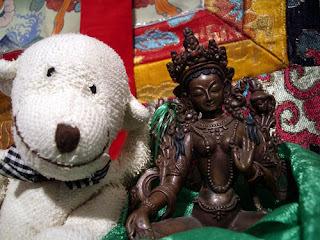 please welcome my good friend chenrezig, the buddha of compassion. you'll recognize him by his white color, the doe skin casually draped around his shoulders and his impeccable ability to accessorize. in addition to a snazzy array of golden jewelry, chenrezig is never without a wish fulfilling jewel cradled between the palms of his hands. 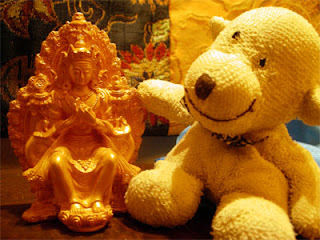 luckily, he has two other hands to hold a beautiful rare kamala flower and a crystal mala. i must admit the effect is stunning. also known as avelokiteshvara, the buddha of compassion has devoted himself to hearing the prayers of all suffering sentient beings. his six syllable mantra (om mani padme hung) is known far beyond the borders of tibetan where you can see it carved into stones, painted on walls and heard on the lips of pilgrims everywhere. his holiness the dalai lama, is considered the living manifestation of chenrezig, but, everyone is welcome to manifest at little compassion whenever possible. three things that happened on this day. 1801 - first census taken in great britain. 1949 - thousands of tibetans were massacred during the unsuccessful uprising against the 10 year of occupation of lhasa by the chinese. daylight savings time begins and it's time to spring forward! i prefer a light free form spring tossing my hands in the air over my head and uttering a joyous and sincere "whee!" and i hit the to of the arc. still others prefer a little running head start before executing their spring. which ever you chooses, here are three things things you often hear on the day daylight savings time starts. finally the clock on my car says the right time! it was invented by william willet in 1907.
contrary to popularbelief daylight saving time does not save energy. i'm celebrating the centenary of international woman's day with a list of 8 women i admire. 8. all the other women i don't have room to mention. list of my 7 favorite prime numbers (in no particular order). your request is my list! becky from montana has requested a list of soothing sounds. so, for her, i present "six soothing sounds" a list in one act. the sound a slice of warm toast makes when you first bite into it. i would love some tea! feel free to compose the rest to the haikus yourself! three important historical events that occurred today. at&t was incorporated in 1885 in the state of new york. mathatma ghandi started his famous fast is 1939.
the difficult to sing "star-spangle banner" was adopted as the the u.s. national anthem. march 2nd in history (also know as texas independence day). two saint days that fall on march 2.
eden over at nablopomo decided that the theme for march is lists. i love a list as much as the next prmate, so, i'm going to give it a go and post a list everyday this month. it's the third month in the western calendar. it's 31 days in length. it's one of three single syllable months. it's named after the roman god of war, mars, not the planet. it's it's one of 7 months that's 31 days in length. 3. things that that make me wonder "how do even know these three things about march?" it comes in like a lion and goes out like a lamb. it's month gem is the aquamarine. 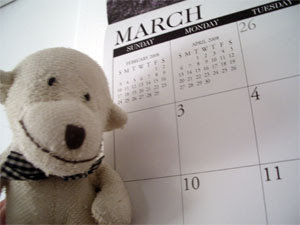 4. three march 1st holidays. the egyptians were baking them a couple thousand years ago, ancient romans ate only the filling and considered the crust as a filling transport system, 12th century england found handpies heavy on the crust and light on savory meat fillings. from pizza to spinikopita to quiche and key lime, every culture and every region has it's own pie history. today's the day to share a slice of pie and make a little history yourself! need some inspiration? 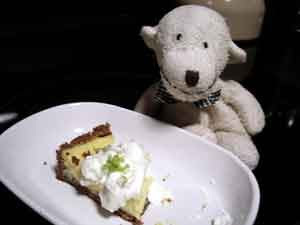 how about my classic key lime pie or if you are a primate on the go, my quick key lime? 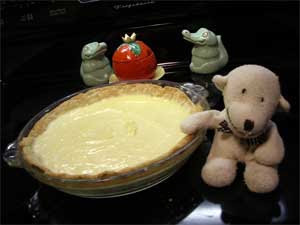 or get a jump on pi day (that's march 14th, you know) with becky's scrumptious lemon sour cream pie? i can't wait! 2008 is going to be great! 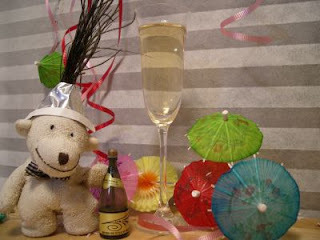 as you can see, i'm ready to ring in the new year with a bit of bubbly and festivities. i hope you have a joyous, healthful, creative, and abundant new year! yes. the potatoes! these international tubers of tastiness have been honored by the united nations for their work in the field of feeding the hungry, protecting natural resources and providing food security for future generations. 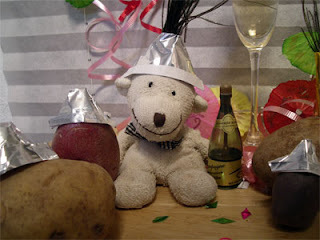 no wonder why 2008 was named the year of the potato! after we ring in the new year, a couple of my pals from idaho and i are kicking of the 2008 in potato-y style with a special batch of potato latkes for brunch. lions and reindeer and bunnies, oh my! By this time next week, the christmas spirit will have given up the ghost. 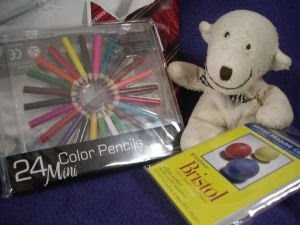 soon, new years festivities will take priority as thank you notes are written and resolutions are contemplated. until then, i'll enjoy the season and indulge in all my favorite christmas movies while snacking on fruitcake and sipping on a mug of cocoa. just in case you're in the mood to join me, here's what i have queued up for this weekend's festive film festival fete. my holiday viewing season was kicked off with the classic grinch that stole x-mas. nothing says "merry christmas! let's slice the roast beast" like boris karloff. but, long before the grinch came on the scene, the holy trinity of children's christmas programing in chicago was the stop-motion classics "suzy snowflake" and "hardrock, coco and joe" and the "frosty the snow man." these short animated music videos of juanty christmas tunes may have been the inspiration for many an animator today. but i can't help wondering if the dwarfs in hardrock, coco and joe are not so distant relations to last years winner of the npr ornament contest "colbert elf"
my holiday viewing menu always includes "olive the other reindeer" based on the delightful book by vivian walsh and j. otto seibold, this animated treat is chock-full-o humor and toe-tapping tunes. drew barrymore's portrayal of our doggie hero-ette is sweet and sincere. i must say, i am a serious fan of the book and was not prepared to like the film. while the plot is different from the book, they have somehow managed to keep the distinctive look of the characters while breathing life into them. when my kitty friends drop by, i always break out the turkey treats and pop in "bell, book and candle" kim novac and jimmy stuarts holiday romp with a charming siamese kitty. now, i know everyone loves rudolph the rednose reindeer. i have to be honest, as much as i admire the craftsmanship of the production, the elf that wants to be a dentist and beryl ives as a singing snowman are just too creepy for me. for my dose of holiday stopmotiony goodness, i turn to nightmare before christmas. what chistmas would be complete with out something by tim burton? certainly not mine! if i'm still hungry for a bit-o-burton, i'll dip into a bit of edward scissorhands as a midnight snack. after all the gifts are wrapped, the cookies baked, and the small electrical fires extinguished, i like to settle down on christmas eve with beverage in hand and a crown on my head to do my best katherine hepburn imitation while watching the lion in winter. what other christmas movie fits in the memorable lines "I know. You know I know. I know you know I know. We know Henry knows, and Henry knows we know it. We're a knowledgeable family. ", "they'll be pork in the tree-tops come morning" and "shall we hang the holly or each other?" after a flurry of christmas morning gift opening, i like to calm down with a plate of cookies cookies, a cup of tea and my vintage vhs tape of the rabbit ears radio's retelling of "the velveteen rabbit." the film is not flashy, just david jergennsen's beautiful illustration with meryl streep reading margery williams original 1922 story of how one little bunny becomes real through the power of love. if that's not a christmas story, i don't know what is.